Aaron Fowler, When Rain Is Right I'm As Right As Rain (left), 2016-17. El Camino (right), 2016-17. Combining found objects, painting, and video, Aaron Fowler’s mixed-media sculptural assemblages include elements one might find on the side of the road, in a junk shop, or in a dumpster. His works are composed of these carefully scavenged materials, ranging from car parts, ironing boards, hair weaves, and CDs to piñatas. 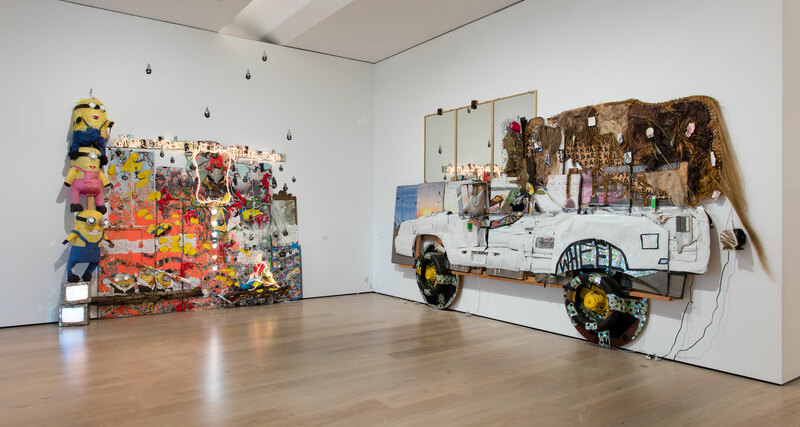 Layered and dense, Fowler’s works address American history, identity, black culture, and hip-hop and are also imbued with deeply personal meaning, often containing images or references to family and friends. He frequently appropriates themes and compositional strategies common to nineteenth-century history painting (covered wagons, pioneers, and other tropes of Americana frequently appear) and reformulates them for a contemporary context. Fowler’s large-scale El Camino is a hybrid of a Chevrolet El Camino wagon and a covered wagon. 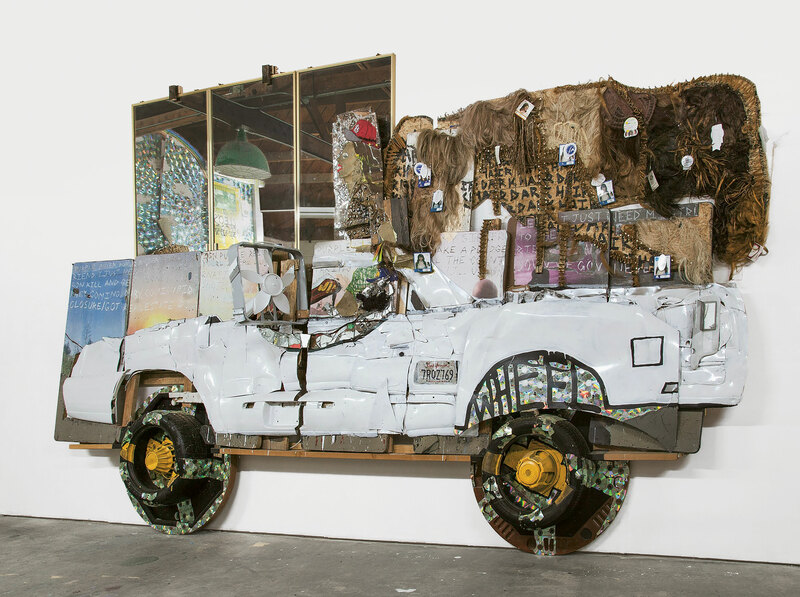 The sculpture consists of discarded car parts that he collected across Los Angeles, a tapestry of hair weaves, crushed CDs, and a portrait of Fowler, as a donkey, with his girlfriend, outfitted in a St. Louis cap. Inspired by a road trip the artist took up the California coast, El Camino is a symbol of freedom, happiness, and a “journey to a new frontier,” as he has put it. Fowler’s other work in the exhibition, When Rain Is Right I’m As Right As Rain, is a multi-part assemblage that consists of text, painted passages, found objects, and video documentation of the artist beating a paint-filled piñata, like those adhered to the left side of the sculpture. Fowler’s performative action was intuitive (piñatas are made to be broken), but it was also a formal choice to disrupt the composition’s cohesion by filling the cartoonish containers with neon orange paint, which then splattered across the work when the piñata burst open. In the center, he appears again as a donkey, an alter ego that symbolizes his personality traits—the good, the bad, the foolish, the flawed, and the perfect. Interwoven throughout Fowler’s works are the artist’s aspirational ideas about self-expression and his belief that creativity can spark transformation and enlightenment. Aaron Fowler (b. 1988, St. Louis, Missouri) currently works in the Harlem neighborhood of New York City, Los Angeles, California, and St. Louis, Missouri. Fowler received his BFA from Pennsylvania Academy of the Fine Arts, in 2011, and MFA from Yale University, in 2014. His work has been exhibited at New Museum, New York (2018); Savannah College of Art and Design Museum of Art, Georgia (2017); Saatchi Gallery, London (2017); Beeler Gallery, Columbus College of Art and Design, Ohio (2016); Diane Rosenstein Gallery, Los Angeles (2016); Rubell Family Collection, Miami (2016); Studio Museum in Harlem, New York (2015); Flanders Gallery, Raleigh, North Carolina (2015); Thierry Goldberg Gallery, New York (2013); and Sophia Wanamaker Gallery, San José, Costa Rica (2012). He is a recipient of the Rema Hort Mann Foundation Emerging Artist Grant (2015) and was an artist in residence at the Skowhegan School of Painting and Sculpture (2014).